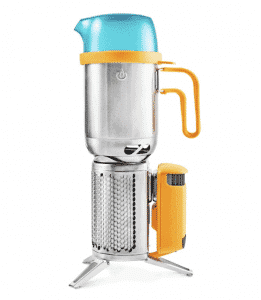 Home » The BioLite CampStove 2 Review | Is It The Worlds Best Energy Efficient Camp Stove? Is it reliable and durable? Is the CampStove 2 expensive? Will the CampStove 2 fit in my car without a problem? 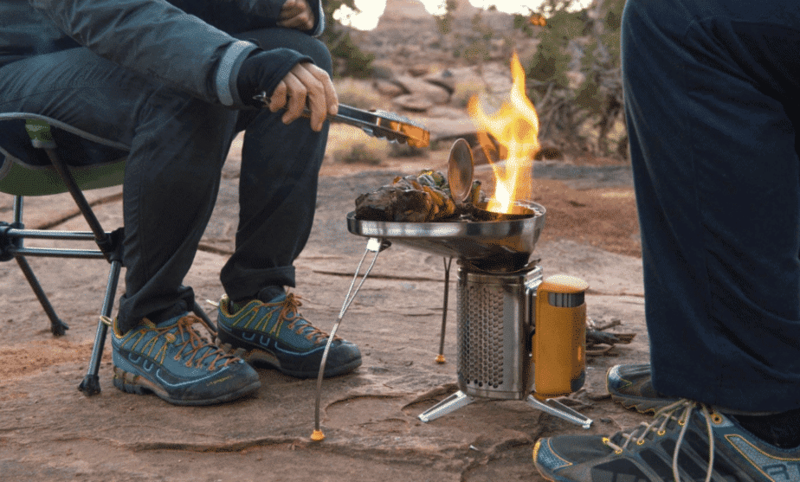 Will the Biolite CampStove 2 Suit You? This camping stove would not have possible 20 or maybe even 10 years ago. Not only does it excel with the basics, we can even charge devices with a USB port. If you want to learn more about the Biolite CampStove 2, its features, and whether this is the right stove for your camping experience, I’ll answer all your questions in this review! When looking for the best camp stove, you need a manufacturer that innovates and is able to lead the market – this is exactly what we have in Biolite. Personally, I loved the design of this particular stove and also enjoyed the fact that I could use the USB port to plug in the FlexLight while cooking. In the past, I’ve made some huge errors while trying to cook in the dark (errors to which I wouldn’t like to admit!). While I was using the CampStove 2, I was also lucky enough to test the Coffee Press and Kettle Pot and grill. When I first started thinking about all this equipment, I had the concern that many campers will recognize – space. However, the coffee press and stove can fit inside the kettle pot and the whole thing has been designed rather efficiently. Compared to a Coleman stove, I would say the water takes just as long to boil. We know that the JetBoil is notoriously quick, but this can sometimes sacrifice reliability. Over the course of two weeks, the CampStove 2 didn’t let me down even while the wind was attacking our tent and faces. If you have the CampStove 1, or are perhaps intrigued as to how it differs, Biolite say they have boosted energy output by 50%. Furthermore, you can instantly assess the battery life via the handy LED dashboard. USB Charger – I know I’ve mentioned it already, but there’s a USB charger on the stove (just think how many times you’ve wished for a USB outlet while camping). Whether it’s for your camera, phone, or any other device, this is pretty much universal so will either come in handy for you or your campmates. 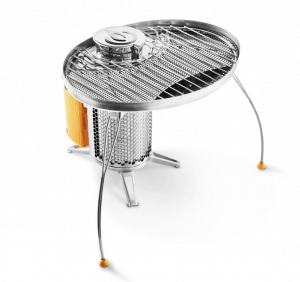 Honeycomb Heat Mesh – Secondly, a common problem with camping stoves is the time it takes for them to cool. With this Biolite design, this is no different. However, the coal can be dumped into a sandpit thanks to the honeycomb mesh and the fire will be killed almost instantly. Stove Fan – Whether you’re happy to wait for the water to boil or are packing in a mad rush (who hasn’t done this at least once? ), the CampStove 2 can be packed full of wood chips. Battery – Finally, something I haven’t mentioned yet is the battery. According to the manufacturer, it can produce 2600mA for around an hour. Personally, this was enough to charge my iPhone once. Before moving onto how it all works, I quickly wanted to mention the Coffee Press which is an additional $14.95 and weighs around 2.3 ounces. For those on a smaller budget, I’ll tell you that this accessory is not essential. However, it’s certainly worth your consideration since it holds 1.5 liters. Rather than boiling two different lots on the JetBoil, you can just use the CampStove 2 once and there should be enough coffee for two people. With regards to the Kettle Pot, this is slightly more expensive at $49.95 and weighs just one pound. 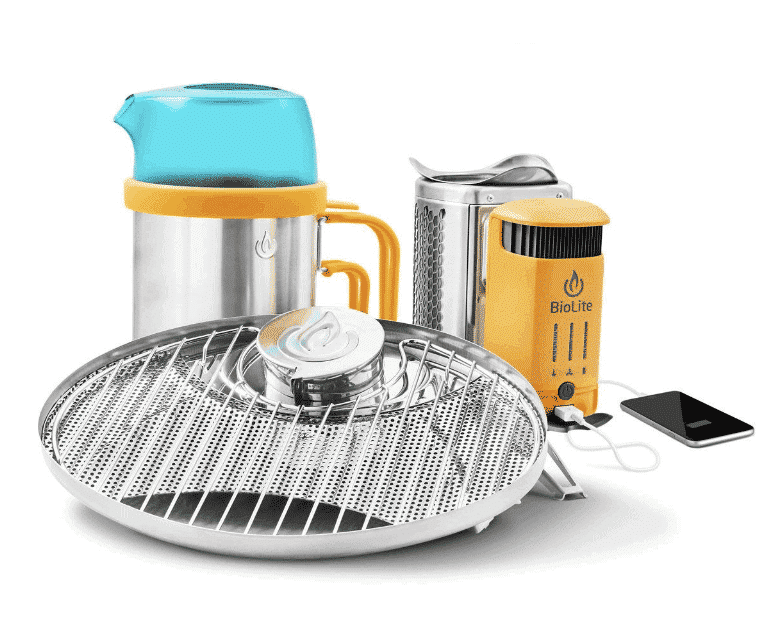 Just as with the Coffee Press, it has been designed brilliantly and all the features have a universal appearance that adds to their efficiency and durability (I’m confident in saying that this whole set could be a reliable partner for even avid campers!). Now we’ve seen all the useful features and accessories, you’re probably wondering how it works. As mentioned previously, Biolite is an innovative company and they’ve shown this again by recycling unused heat. As you cook, a heat probe captures the energy and then converts it into electricity which powers the internal fan or allows us to charge our phones and keep up to date with social media (depending on the strength of signal, of course!). Not only does the stove generate electricity, it stores it too. What does this mean? Well, you can carry wood chips or collect twigs to build a fire and this saves camp fuel. From here, you’ll be charging your phone using the heat of the fire. Has camping ever been more efficient? If you’re in a state that forbids the collection of firewood, like Utah, just visit a hardware store and you should find wood chips or pellets for a few dollars and you’ll be good to go. In terms of logistics, other cook pots will work with the CampStove 2. However, the Kettle Pot has obviously been designed especially for the model. Building a hot fire is no trouble because the Kettle Pot has small holes in the bottom to aid ventilation. As a self-fueling unit, the fan can be used to really grow a fire after just a tiny bit of heat. With the four different settings, I found this really helpful while cooking. Biolite’s claim to boil water in 4.5 minutes might be a bit of a stretch for most, so be ready to wait a little longer than white gas stoves. If you’re reading this with questions spinning around your mind, let’s see if I can answer one or two of them here. When considering the best camping stove, reliability plays an important role. It’s all well and good working once, but will it provide a good experience time and time again? For me, and the hundreds of people that have left positive reviews on Amazon, the answer would be a resounding ‘yes’. I’m quite heavy-handed and my equipment sits in my car while I travel around the country, and all I’ve seen so far are some simple scuff marks. With a price tag of around $130, (not including accessories) it’s fair to say you need to be camping regularly to really make use of your investment. However, when compared with the best camping stoves, they all seem to fall within a similar range. Additionally, there’s a general rule that a larger investment leads to improved durability and this is definitely the case with the CampStove 2; you also have to consider the money you’re saving on fuel. What’s more, the CampStove 2 comes with a battery – something that could cost up to $40 when purchased separately. Therefore, we think Biolite is actually reasonable with their pricing of this fantastic product. Weighing just over two pounds, I don’t recommend going on world-record hikes with this camp stove. However, if the camp is close enough to the car (or even if you’re car camping), the brilliant features of the stove should outweigh the effort of getting it into place. Currently, I’m confident in saying that no other manufacturer can compete with the innovation shown from Biolite Energy. If you’re going to carry an external battery too, you might as well go for this stove and get both in one. What if you buy the stove and regret it a couple of days later? In truth, this is a concern for us all and the fear becomes more prominent the more money we spend on the investment. Therefore, I recommend considering your needs before making any decisions. For many, fuel canisters make them nervous (count me in this list!). Even though I haven’t had any major accidents, I’ve had friends who have had moisture get into the can and woken up to find it frozen. Since they’re light, and denatured alcohol is easy to find, I like to use a cat stove while backpacking. Yet, I know that this solution is useless for all high-altitude trips because even Heet won’t burn well while thousands of feet above sea level. Therefore, in states like Colorado and Utah, the CampStove 2 would be ideal if you can split the weight between all campers. In terms of the competition, the MSR pocket rocket is much lighter than the CampStove 2…but you’ll have to pay more for fuel. Also, gas canisters shouldn’t be thrown in the trash which makes disposal awkward. Some people like to make their own stove, but this brings the same problem as we’ve just seen at higher elevations. If elevation isn’t an issue, I recommend looking into the MSR pocket rocket or even a pop-can stove since they’re light and you don’t have to mess around with firewood. As a solo backpacker, this isn’t a product I would use myself. This doesn’t mean it won’t be the best camp stove for you, so always consider your own needs first. If I was car camping with friends, I would take the CampStove 2 in a heartbeat because weight isn’t a problem. Suddenly, I’d have access to all the fantastic features and all my friends will be jealous. Easy to set up, no worrying about fuel, and useful accessories, it’s a superb product. For solo backpackers, you could still take the CampStove 2, but it depends on your plans and whether the weight will be too much. To finish, I want to break down the main benefits and drawbacks in my own opinion. Also, I’ll go into how the camp stove is performing on Amazon. Great accessories mean you can grill, boil, and cook. Efficient and no need for fuel. Offers a charger for devices. Wood pellets are easy to obtain. When the wood is wet, or if it’s windy, the smoke can become a problem. The weight may be an issue for some. Some have noted the fan as making lots of noise, but I didn’t experience this myself. The CampStove 2 has a really good rating on amazon, head over and see for yourself. For many, they noted how it takes a few trips to get used to the features and optimize performance, but this isn’t necessarily a bad thing. If you don’t get the knack after the first couple of trips, keep going because you will be rewarded. If we look at the lower reviews, a ‘poor’ charging function seems to be a common complaint. Unfortunately, you won’t be able to charge electronics until the battery is fully charged so you’ll need to bear this in mind. To extend the life of the battery, make sure it charges fully on the very first use. Thank you for reading my review of the CampStove 2. When it comes to camp stoves, it’s all about finding the product that suits YOUR needs. While some people camp once a year at a low elevation, others camp weekly at a variety of elevations. Once you understand this, you’ll also realize that the CampStove 2 isn’t a magical solution that works for everybody. This being said, the innovation from Biolite still impresses me and I think the accessories could really come in handy. If you treat it well and learn the intricacies of how it works, I believe it can be a reliable partner for many years to come! Check On AmazonPlease note: if you buy via one of our links on Amazon we will receive a small commission from Amazon. This helps with the upkeep of our blog. We will NEVER give an unfair or biased review in order to receive commissions. Our reviews are real and not fabricated in any way shape or form. Thanks for stopping by our blog.